Imagine pushing beyond 500 seat theaters or 3000 seat concert halls and performing your art for millions of people who would not otherwise have access to it. It is an amazing experiment in democratizing the cultures and fine arts of our times. It is also totally terrifying to everything we know and understand about the business of the arts, the history of technological advances in our fields, and the loyalties (or lack thereof) of audiences for the authentic experience of live performance. Why invest in the enemy? We’ve all had to deal with it before…the lone cellphone ringing during a performance…we nervously shift in our seat…throw eyes towards the culprit…want to strangle them for not understanding how to quickly silence their phone…it’s not rocket science, you just HIT THE BUTTON! And when the New York Philharmonic stopped their performance of Mahler’s No. 9 to deal with an iPhone Marimba, the world stood still until the device was finally, shamefully, silenced. So, it begs the question: Why would we embrace technologies such as online streaming, mobile platform integration, cell-phones, etc if they far too often cause more problems than their worth. If they encourage audience members to be distracted, less disciplined, less “art-focused,” less all-enthralled by what the gods artists are presenting to them on stage, why should we make them an integral part of our tool box? As artists, especially those interested in the convergence of traditional and new forms of media, we should strive to explore the middle spaces created where discrete ideas crash into each other. We should look at ways to leverage one form of story telling or expression to help the other mean more, do more, and reach more. We should meet audiences where they are and how they live so that they can understand why what we do is important to them..right now…in this moment. The technology has been available, since 2001, to do things such as synchronize cell phones to play a symphony. We’ve been able to do large scale graphic/video mapping onto buildings for several years. QR Codes are almost every day objects we interact with when carrying our smartphones. GPS tracks your position constantly through your phone. Wireless networks stand as potential doorways for not only access, but targeted information. 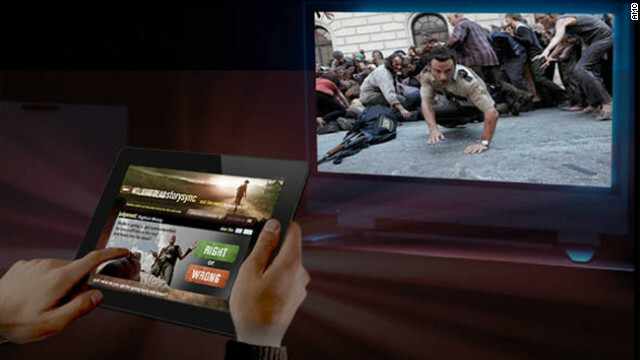 And, with apps like Shazam leading the way, our ability to sync what is happening around us (through audio cues) to what is being displayed on our devices is making shows like The Waking Dead a multi-screen event. So, it doesn’t take much to imagine a time when engaging with a piece of artwork could mean additional information populates your phone when your GPS or NFC (Near Field Communication) technology notices you are close to something. Or, watching a dance performance using augmented reality filter on your iPad to see a dancer on an empty stage interact with a fully fleshed out environment on your screen. Or being able to live translate an opera into any language, define words, and begin to learn how to use them in your own quest to be bilingual, right there in your seat. The possibilites, as goes the technology, are endless. But can we be creative about it?